Daniel’s love of music began studying the Piano as a young teenager soon progressing to brass instruments, principally the Trumpet, sitting various examinations for both of these instruments. Later Daniel took the opportunity to take up the Violin, Clarinet, Guitar and the Bagpipes as the opportunities arose. Daniel has played for public performances in several of the large concert venues in London including The Royal Albert Hall and The Barbican and many other locations both as a soloist and with various orchestras and other groups. 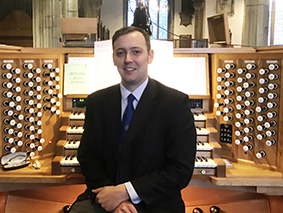 Ultimately, Daniel settled with his passion for the organ and Church music, studying organ with Jonathan Melling. In his professional life, Daniel is employed by a long established firm of organbuilders where he has spent much of his working life and serves with them as Company Secretary and London Works Manager. Naturally, his working environment has kindled Daniel’s musical development and he has developed a special interest in tone colour and has been able to work on his organ playing and choral interests. Daniel has worked with several choirs, both as a singer and as Choirmaster. He has performed as a Soloist on many occasions but now sings between his other commitments with the London Ripieno Singers under the direction of Geoffrey Hanson.